From 1835 to 1841 Karl Marx studied political science, philosophy and history in Bonn and Berlin, where Marx joined the Jungian-Hegelian movement. In 1842/43 Karl Marx worked as an editor for the liberal Rheinische Zeitung in Cologne. In 1843 Karl Marx and Jenny von Westphalen married and moved to Paris, as he lost his editing position due to his radicalism . . . . He studied Socialism and Communism in Paris and worked closely with Friedrich Engels. In 1845 Marx and Engels co-wrote The Holy Family, Marx furthermore wrote The German Ideology, which was first printed in 1926 and he developed the fundamental ideas for his theory. Karl Marx was expelled by the Prussian government and went to Brussels, followed by Engels. In Brussels Marx published Misere de la Philosophie, a treatise against the bourgeois Socialism of Proudhon in 1847 . . . . 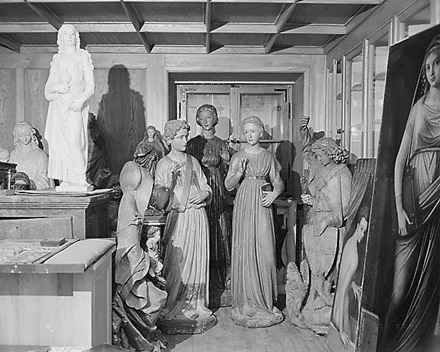 In 1847 Karl Marx and Friedrich Engels founded the 'Deutscher Arbeiter-Bildungsverein' and the 'Association democratique' in Brussels, which had links to the London Communist 'League of the Righteous'. The 'League of the Righteous' asked Karl Marx to write a manifesto for their re-formation as 'Communist League' in 1847, which he did together with Engels. They wrote the Communist Manifesto in 1848, a radical criticism of the bourgeois social and economic order and a call upon the international proletariat for class struggle. In the revolutionary year of 1848 Marx was expelled from Brussels and went to Cologne, where he reshaped the Neue Rheinische Zeitung in a left-wing democratic spirit. After the suppression of the paper Karl Marx went to London, where Friedrich Engels supported him in his scientific work. Marx was a leading member of the 'First International' founded in London in 1864. There he also wrote his main pieces The 18th Brumaire of Napoleon (1852), Preface to a Contribution to the Critique of Political Economy (1859), and most importantly Capital (1867, volumes 2 and 3, published by Friedrich Engels, 1885-94) . . . .
1821 Death: Napoleon Bonaparte: The former French ruler who once ruled an empire that stretched across Europe, dies as a British prisoner on the remote island of Saint Helena in the southern Atlantic Ocean. The Corsica-born Napoleon, one of the greatest military strategists in history, rapidly rose in the ranks of the French Revolutionary Army during the late 1790s. By 1799, France was at war with most of Europe, and Napoleon returned home from his Egyptian campaign to take over the reigns of the French government and save his nation from collapse. After becoming first consul in February 1800, he reorganized his armies and defeated Austria. In 1802, he established the Napoleonic Code, a new system of French law, and in 1804 was crowned emperor of France in Notre Dame Cathedral. By 1807, Napoleon controlled an empire that stretched from the River Elbe in the north, down through Italy in the south, and from the Pyrenees to the Dalmatian coast. 1860 Italy: Giuseppe Garibaldi and his 'Thousand Redshirts' sail from Genoa to conquer Sicily and Naples in a bid to unify Italy. 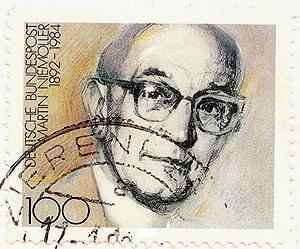 1921 Death: Alfred Hermann Fried: Austrian Jewish pacifist, publicist, journalist, co-founder of the German peace movement, and winner (with Tobias Asser) of the Nobel Prize for Peace in 1911. 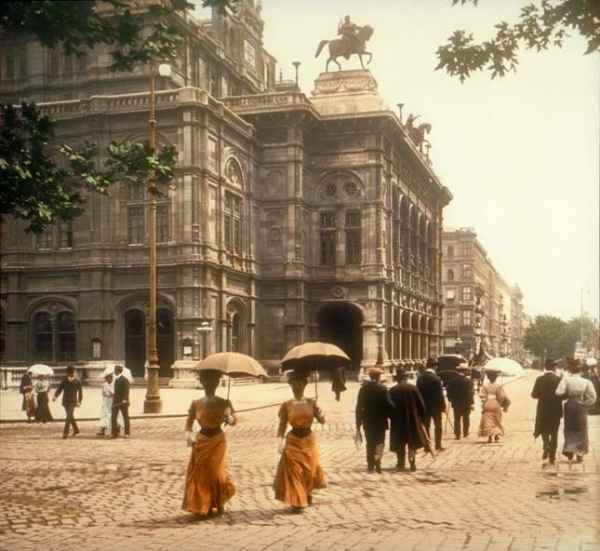 1925 Mysticism: Dr. Karl Haushofer founds the Deutsche Akademie. 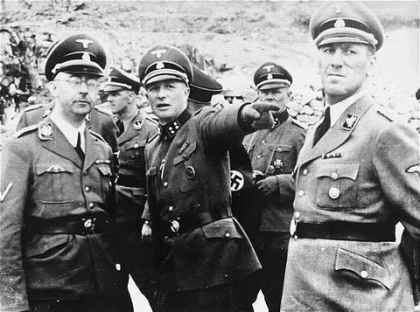 Rudolf Hess becomes an assistant on his staff and a close friend of Haushofer's son, Albrecht. Hess later abandons the idea of obtaining a doctorate. 1933 Holocaust: Germany: University students in Cologne burn books concerning Judaism or written by Jewish authors. 1936 Abyssinia: Mussolini announces total victory over Abyssinia (Ethiopia). Although the League of Nations has imposed an embargo against Italy, it fails to include a vital item, oil, thereby discrediting itself once again. This afternoon I asked the Soviet Charge, Counselor of Embassy Astakhov, to come to see me and informed him that we had agreed, as requested by his Ambassador on April 17, to carry out the Soviet supply contracts with the Skoda Works. Appropriate instructions had already been given. I asked him to inform his Government of this. Counselor of Embassy Astakhov was visibly gratified at this declaration and stressed the fact that for the Soviet Government the material side of the question was not of as great importance as the question of principle. He inquired whether we would not soon resume the negotiations which had been broken off in February. To this I replied that I could not yet give him any answer to that, as the examination of the numerous problems which the last Russian answer had raised was not yet completed. Then Astakhov touched upon the dismissal of Litvinov and tried without asking direct questions to learn whether this event would cause a change in our position toward the Soviet Union. He stressed very much the great importance of the personality of Molotov, who was by no means a specialist in foreign policy, but who would have all the greater importance for the future Soviet foreign policy. Government-in-exile is formed in London. Ethiopian Emperor Haile Selassie re-enters Addis Ababa, the Ethiopian capital, exactly five years to the day of when it was occupied by Italy. United States: Sales of sugar are resumed under a rationing program. Madagascar: A combined British military and naval force lands. By the afternoon, the town of Diego Suarez is captured. Philippines: Japanese forces land on the island of Corregidor. [The] simplest and most practical method that I can think of would be an informal and completely simple visit for a few days between you and me. I fully appreciate the desirability for you to stay in daily touch with your military operations; I also find it inadvisable to be away from Washington more than a short time. The first relates to timing. There is always the possibility that the historic Russian defense, followed by taking the offensive, may cause a crack-up of Germany next winter. In such a case we must be prepared for the many next steps. We are none of us prepared today. Therefore, it is my belief that you and I ought to meet this summer. The second problem is where to meet. Africa is almost out of the question in summer and Khartoum is British territory. Iceland I do not like because for both you and me it involves rather difficult flights, and, in addition, would make it, quite frankly, difficult not to invite Prime Minister Churchill at the same time . . . . I greatly hope our forces will be in complete control of Tunisia by the end of May, and Churchill and I next week will be working on the second phase of the offensive. Our estimates of the situation are that Germany will deliver an all-out attack on you this summer, and my staff people think it will be directed against the middle of your line. You are doing a grand job. Good luck! 1944 Death: Driving pioneer Bertha Benz: The wife of inventor Karl Benz and the first person to drive an automobile over a long distance, dies on this day . . . in Ladenburg, Germany. 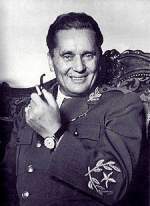 Yugoslavia: partisan leader Tito signs an agreement permitting "temporary entry of Soviet troops into Yugoslav territory." Josip Broz, alias "Tito," secretary general of the Communist Party of Yugoslavia, led a partisan counteroffensive movement against the Axis occupying powers of Germany and Italy in 1941. Recognized by the Allies as the leader of the Yugoslav resistance, he was, in fact, the leader of a power grab meant not only to expel the Axis forces but to wrest control of Yugoslavia in the postwar environment from both royalist and democratic movements. Once the Soviet army liberated Serbia, the fate of Yugoslavia as a communist-dominated nation was sealed. Tito's task now lay in remaining independent of both the U.S.S.R. and the West. To this end, he created a "second Yugoslavia," a socialist federation that became known for its nonalignment stance. [We] cannot be satisfied that persons should be associated with the formation of the future Polish Government who, as you express it, 'are not fundamentally anti-Soviet,' or that only those persons should be excluded from participation in this work who are in your opinion 'extremely unfriendly towards Russia.' Neither of these criteria can satisfy us. We insist, and shall insist, that there should be brought into consultation on the formation of the future Polish Government only those persons who have actively shown a friendly attitude towards the Soviet Union and who are honestly and sincerely prepared to cooperate with the Soviet State . . . . It appears from your message that you are not prepared to regard the Polish Provisional Government as the foundation of the future Government of National Unity, and that you are not prepared to accord it its rightful position in that Government. I must say frankly that such an attitude excludes the possibility of an agreed solution of the Polish question. Since you are well acquainted with the position of the US Government from the messages you have received from President Roosevelt and myself, I need hardly tell you that I agree with the views set forth in Mr. Churchill's message of April 28 in regard to the reorganization of the Polish Government . . . . I must tell you that any suggestion that the representatives of the present Polish Provisional Government be invited to San Francisco, conditionally or otherwise, is wholly unacceptable to the Government of the United States. For the United States to agree to such an invitation would mean to accept the present Warsaw Provisional Government as representative of Poland. This would be the equivalent to abandoning the agreement reached in the Crimea. In the North, Eisenhower threw in an American corps with great dexterity to help Montgomery in his advance on Luebeck. He got there with twelve hours to spare. There were reports from the British Naval Attaché at Stockholm, which we are testing, that, according to Swedish information, the Russians have dropped parachutists a few miles south of Copenhagen and that Communist activities have appeared there. It now appears there were only two parachutists. We are sending in a moderate holding force to Copenhagen by air, and the rest of Denmark is rapidly being occupied from henceforth by our fast-moving armored columns. I think therefore, having regard to the joyful feeling of the Danes and the abject submission and would-be partisanship of the surrendered Huns, we shall head our Soviet friend off at this point too. You will by now have heard the news of the tremendous surrender that has been made to Montgomery of all Northwest Germany, Holland, and Denmark, both as regards men and ships. The men alone must be more than a million. Thus in three successive days 2,5000,000 Germans have surrendered to our British commanders. This is quite a satisfactory incident in our military history. Ike has been splendid throughout. We must vie with him for sportsmanship. I had no connections with anybody who had been sent to a concentration camp; with the exception of Pastor Niemoeller. Pastor Niemoeller was a former comrade of mine from the Navy. When my last son was killed, he expressed his sympathy; and on that occasion I asked him how he was. I received the answer that he was all right . . . . I received this information through a third person. 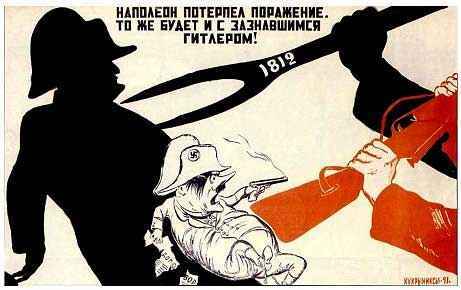 I should have known better, but I decided to call Stalin in order to congratulate him on the capitulation of Germany. 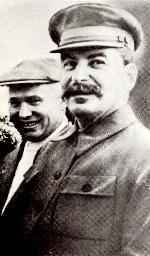 When he answered the phone, I said, 'Comrade Stalin, permit me to congratulate you on the victory of our armed forces and our people over the German army.' And what was his response? He cut me off rudely and said I was wasting his time. I was simply dumbfounded. I rebuked myself for having called him in the first place. I knew what sort of person he was, and I should have expected exactly what happened. As I have already said, Stalin was a good actor. He was pretending now that since the war was over and done with, he was already thinking about other, more important matters; why should I waste his time talking about yesterday when he was straining his mind, thinking about tomorrow? He acted as though he weren't in the least surprised by our victory. He wanted me to think that he had known all along how the war would turn out. But I knew better. I had watched him during moments of crisis. 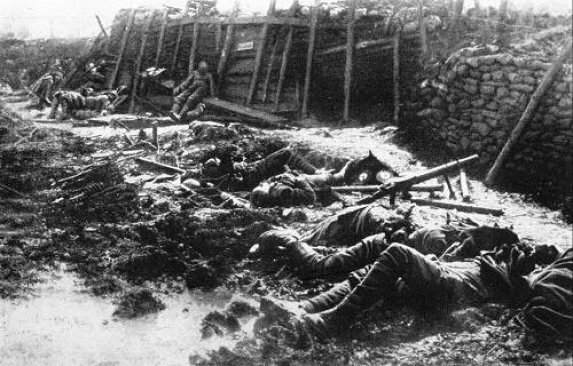 I knew that during the war he had been even more worried and afraid than the people around him. 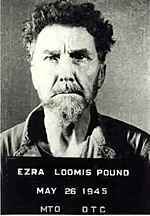 Italy: Pro-Fascist poet Ezra Pound is arrested for treason. 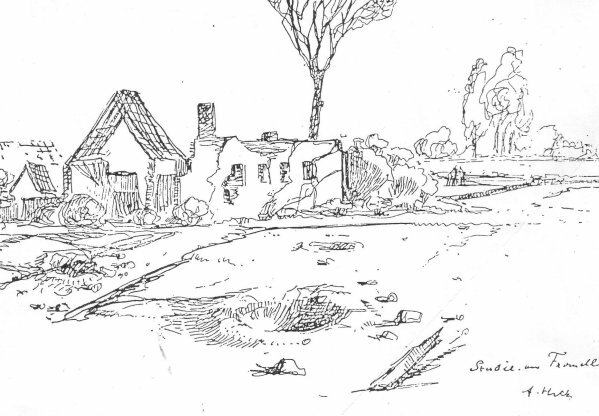 German Army Group G surrenders to the Americans at Haar in Bavaria. Occupation: The US War Department announces that 400,000 men will remain in Germany as an occupation force. Denmark: Fighting breaks out in Copenhagen and is brought to an end when British forces arrive by air. The Federal Republic of Germany (West Germany) becomes a sovereign state when the United States, France, and Great Britain end their military occupation, which had begun in 1945. With this action, West Germany was given the right to rearm and become a full-fledged member of the western alliance against the Soviet Union. In 1945, the United States, Great Britain, and France had assumed the occupation of the western portion of Germany (as well as the western half of Berlin, situated in eastern Germany). The Soviet Union occupied eastern Germany, as well as the eastern half of Berlin. As Cold War animosities began to harden between the western powers and Russia, it became increasingly obvious that Germany would not be reunified. By the late-1940s, the United States acted to formalize the split and establish western Germany as an independent republic, and in May 1949, the Federal Republic of Germany was formally announced. In 1954, West Germany joined the North Atlantic Treaty Organization (NATO), the mutual defense alliance between the United States and several European nations. All that remained was for the Americans, British, and French to end their nearly 10-year occupation. This was accomplished on May 5, 1955, when those nations issued a proclamation declaring an end to the military occupation of West Germany. Under the terms of an agreement reached earlier, West Germany would now be allowed to establish a military force of up to a half-million men and resume the manufacture of arms, though it was forbidden from producing any chemical or atomic weapons. 1961 Wunderwaffen: The USA becomes the second nation to achieve manned spaceflight, as NASA launches a Mercury-Redstone 3 rocket, piloted by Mercury astronaut Alan B. Sheppard. An estimated 100 million Americans watch on television, or listen on their radios, as the tiny Mercury capsule, propelled by a Redstone rocket—originally designed by Wernher von Braun and his team as a weapon of war—propels Sheppard into space. He travels 115 miles up, and 302 miles downrange on its fifteen-minute flight. Then-German Chancellor Helmut Kohl, who suggested the visit, accompanied Reagan to the cemetery, where 2,000 German troops are buried. Reagan laid a wreath at the base of a monument to fallen German soldiers. What he did not know was that the cemetery included the graves of 49 of Hitler's infamous SS (Schutzstaffel), the paramilitary organization that planned and carried out the massacre of approximately 6 million people in death camps during World War II. 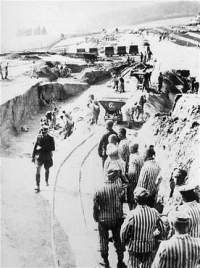 Before going to Bitburg, Reagan had visited the site of the Bergen-Belsen concentration camp, in which victims of Nazi persecution, mostly Jews, were exterminated. 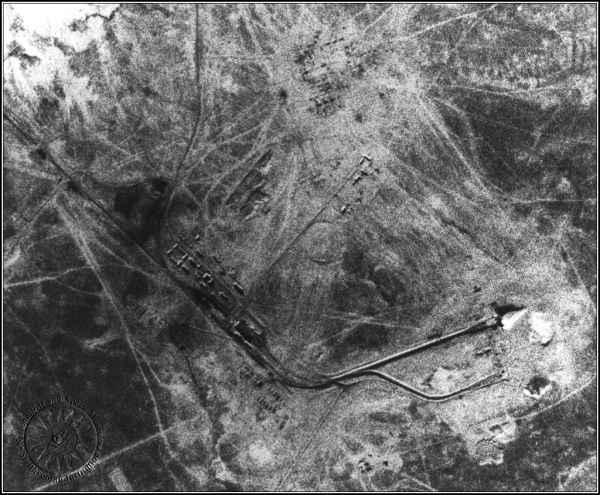 At Bergen-Belsen, Reagan stood by a marker identifying a mass grave of 50,000 bodies and said solemnly, "here they lie. Never to hope. Never to pray. Never to love. Never to heal. Never to laugh. Never to cry." Reagan chose to visit both Bergen-Belsen and Bitburg in an effort to honor all victims of World War II, including German soldiers. He also hoped the tour would acknowledge America's strong relationship with Germany since the end of the war, saying "we who were enemies are now friends." Reagan's visit to Bitburg angered not only Jewish leaders and families of Holocaust victims, but also political leaders and citizens in America, France, Britain, West Germany, Belgium and the Netherlands. At an American airbase later that day, after having been told of the SS troops buried at Bitburg, Reagan shared his regret over the visit, saying it had "opened old wounds." Reagan's advisors later admitted that the Bitburg visit was a fiasco that had tarnished the president's image.